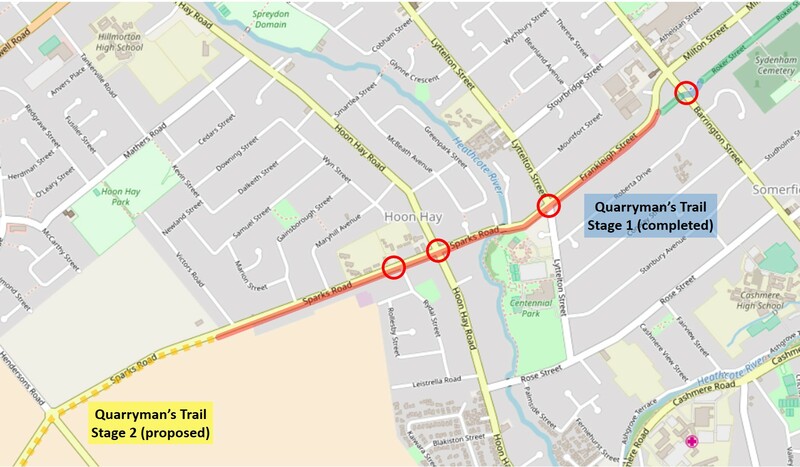 As mentioned recently, the first section of the Quarryman’s Trail, from town to Hoon Hay (4.5km), is now completely open. So it’s time to provide a preview of what to encounter (we’ll look at it heading towards town – click on any figures to enlarge). 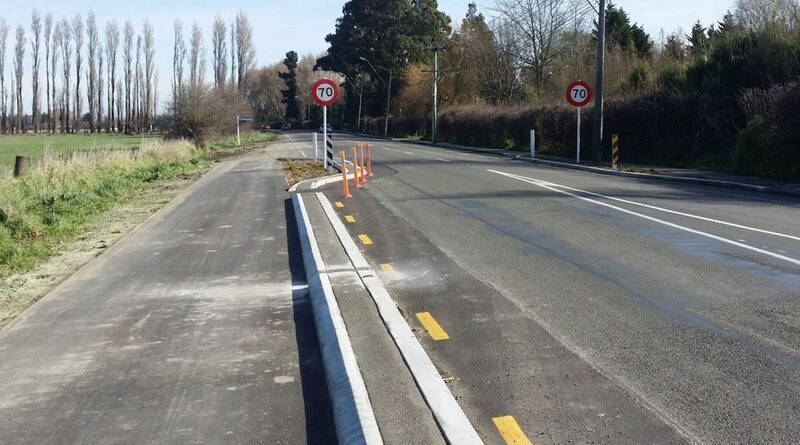 The cycleway will eventually make its way all the way to Halswell, but for now it starts at the urban boundary on Sparks Rd near Victors Rd in Hoon Hay. The first section is a two-way separated cycleway on the south side of the road. 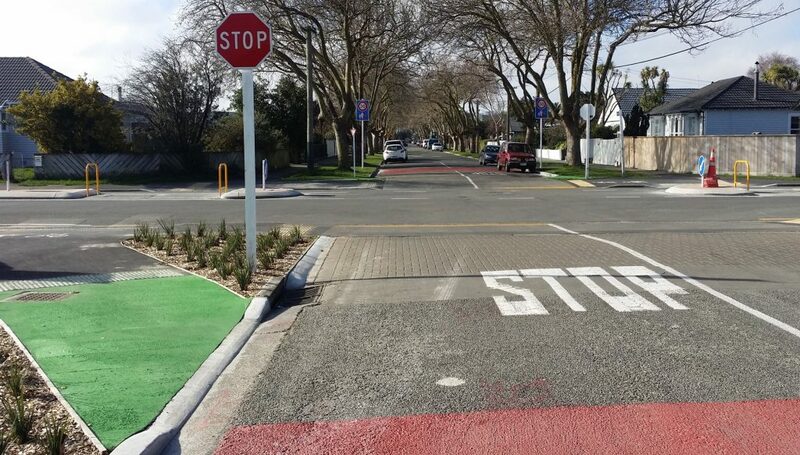 Coloured surfacing and markings are used regularly to identify crossings along the way, and at busier accessways even greater delineation and signage is used. 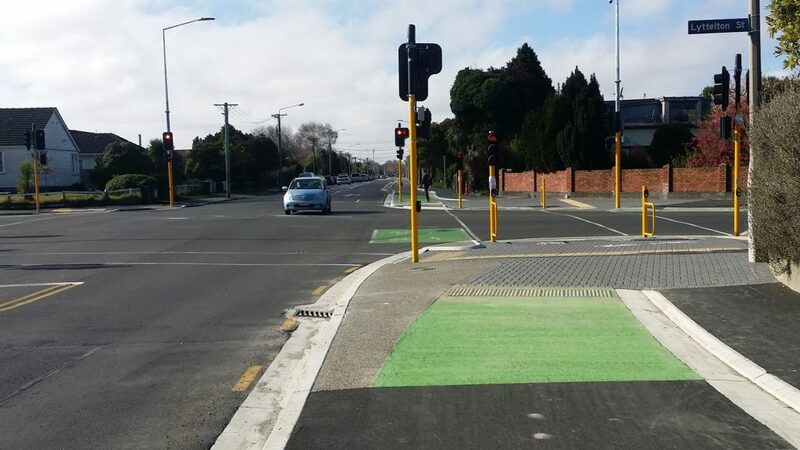 A number of new traffic signals are provided along the way to help cyclists cross busy roads. There is also a signalised crossing to help schoolchildren get across the road to the two primary schools in Hoon Hay. 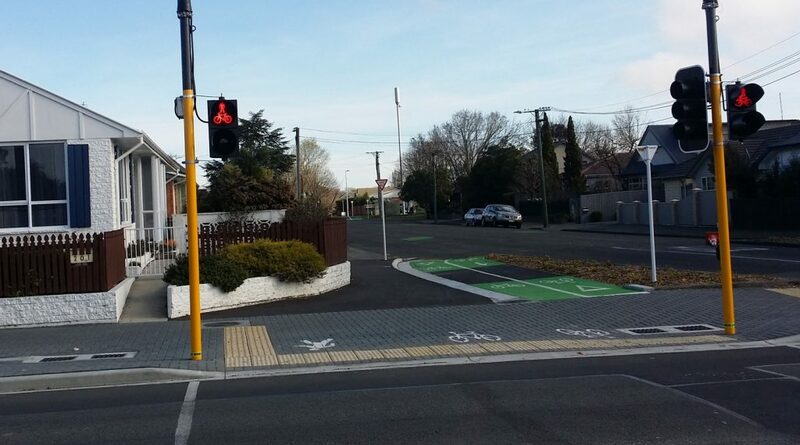 At Hoon Hay Rd is the first of a number of signalised intersections with new cycle signals to help cross. Turning traffic is held back while cyclists (and pedestrians) cross, then cyclists are stopped to let turning traffic go. As well as detectors at the crossings themselves, advance cycle detectors have been provided on the approach to the intersections where possible. This can ensure that the cycle signals will be green if you arrive just after the lights change. 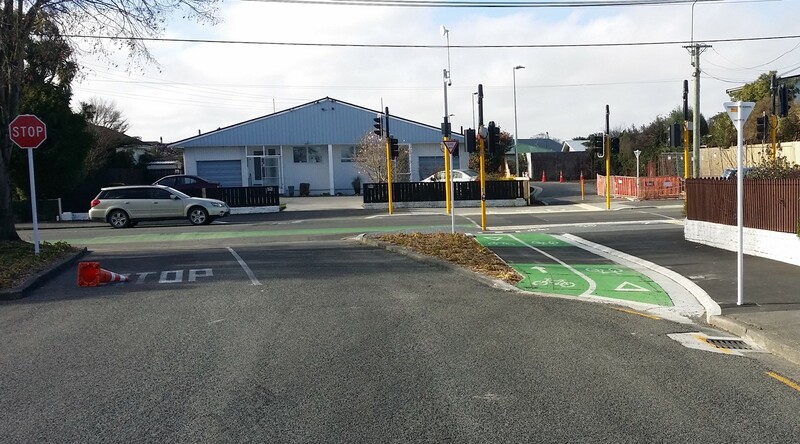 At Lyttelton St, the cycleway is brought up to the footpath for a shared crossing. While I get that both travel modes cross at the same time, it still seems unnecessary to merge the two groups together here. Hook turn boxes feature at most intersections along the way for turning onto side streets (BTW if you haven’t come across this great explanatory video from CCC yet, it’s worth a look!). 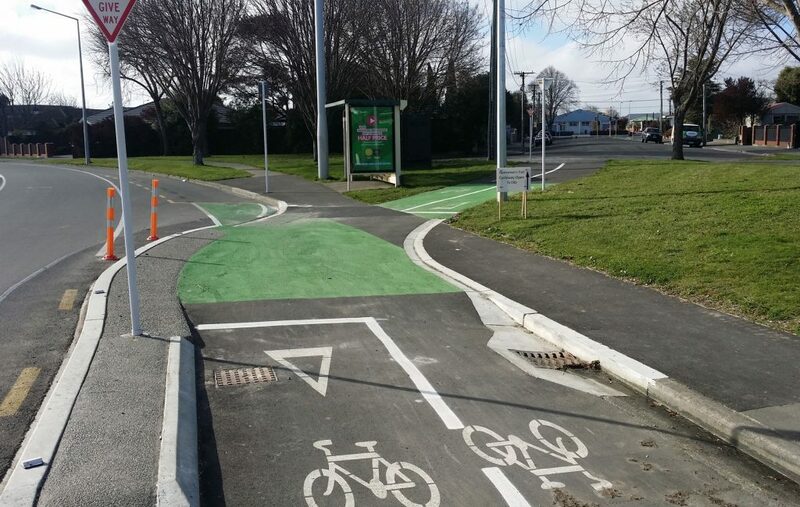 An interesting feature along the two-way cycleways are these “bi-directional” hook turns, allowing you to turn from both directions. 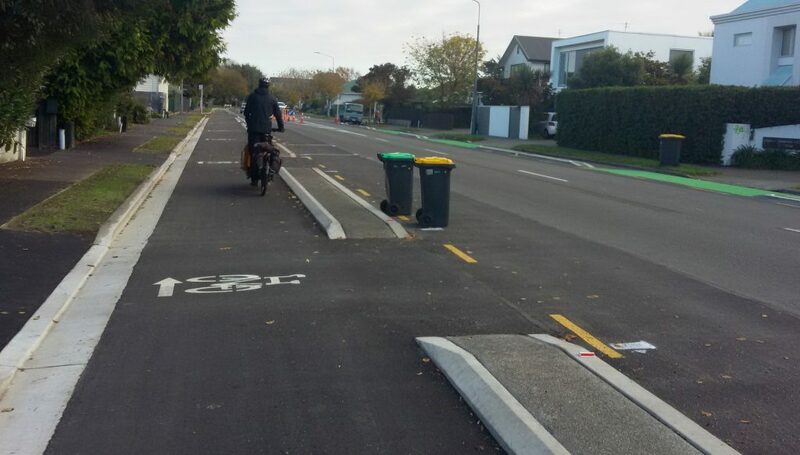 Generally the two-way cycleway is a very generous width for riding both ways (or riding two abreast one-way). Cars exiting driveways should be able to poke their noses out to check traffic without having to block the whole cycleway (even someone backing out can probably do likewise). Where Frankleigh St bends towards Milton St, the cycleway route departs the main road and connects to a short neighbourhood greenway in Strauss Place. 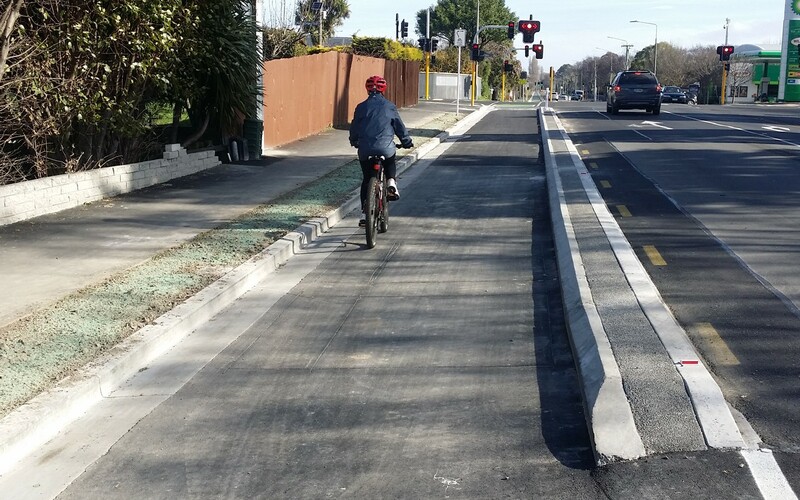 At Barrington St, the cycleway uses a new signalised crossing to get you over to a new link pathway. 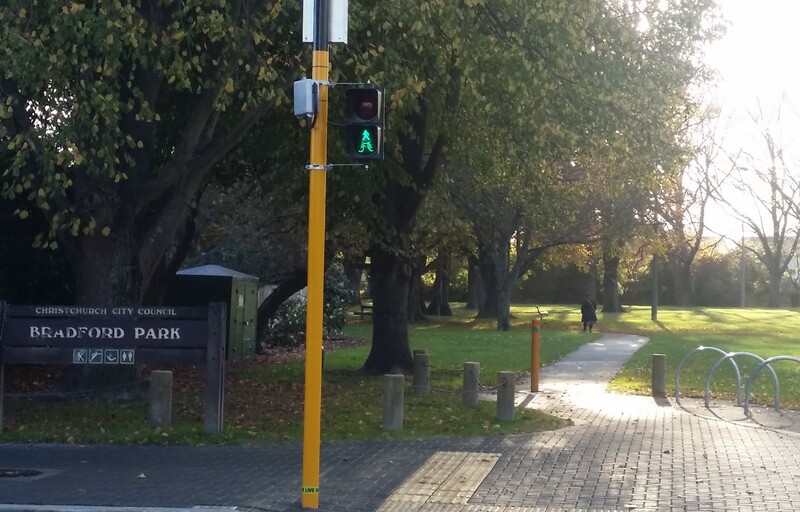 This is one of a number of new joint pedestrian/cycle signals being trialled here that feature both user symbols within the same signal head (note: the signals will only display when you are detected or push the button for crossing). The new shared pathway connecting to Roker St was the last piece of the route to be completed, now enabling a continuous cycleway route right through to town. The next section along quiet Roker St uses a neighbourhood greenway treatment to make cycling a bit friendlier. Common tools used to help manage traffic speeds and encourage shared use along Roker St are raised platforms and sharrow markings. A 30km/h speed limit has been applied to this section as well, indicated by a neat (and technically not yet approved) sign, modelled on Dutch fietstraaten. 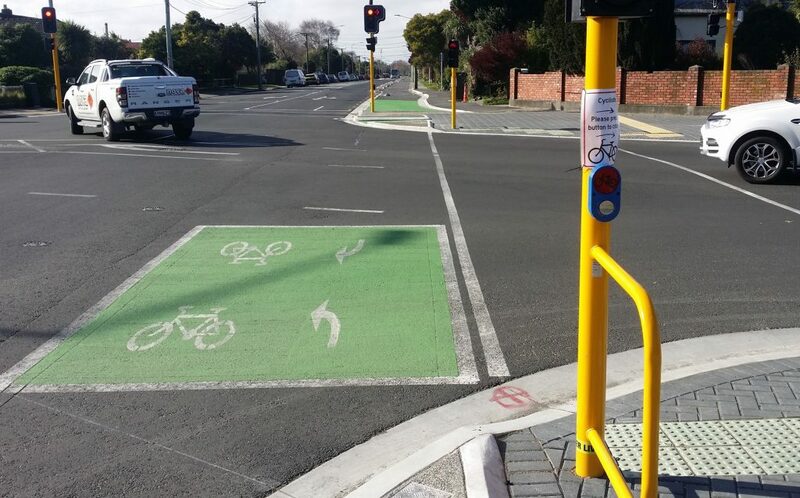 A shared bicycle street sign – what do you think? 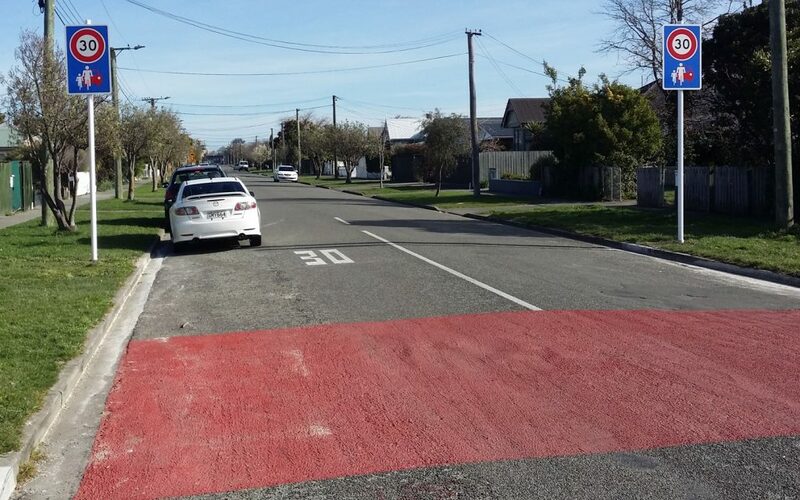 Where the route crosses Selwyn St, traffic islands have been provided on each side of the cross-road to help less confident riders (and pedestrians) to get across – useful given a number of schools in close proximity. The Roker St greenway ends at Strickland St, where a new signalised crossing helps people to get across the road, depending on their intended destination. 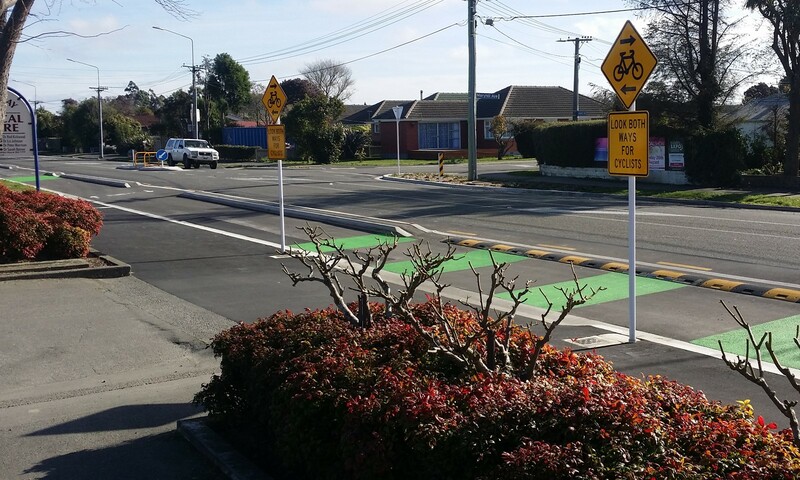 Again, combined pedestrian/cycle signals are used at this crossing; the results of these trial sites will be used to determine national policy on these. Combined signal heads – what do you think? 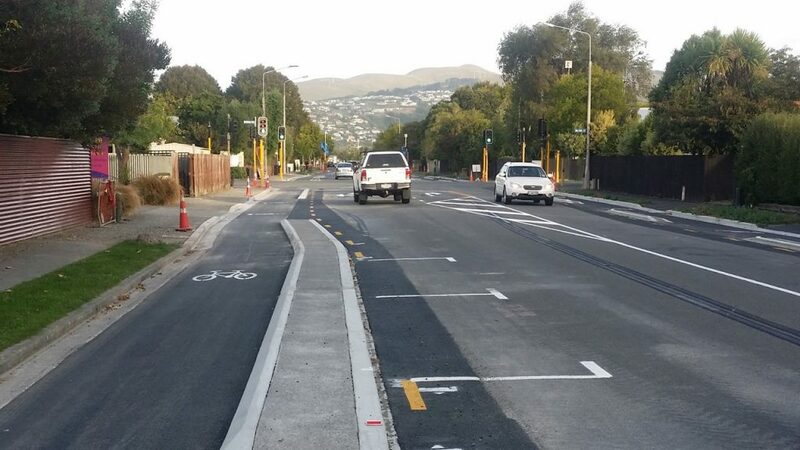 At this point, the cycleway turns north onto Strickland St and switches to one-way separated cycleways on each side. As with the other intersections, special cycle signals along this corridor give riders first movement before turning traffic is allowed to go. Again, detectors ahead of the intersection help riders to get a green signal even if they haven’t quite reached it when the lights change. 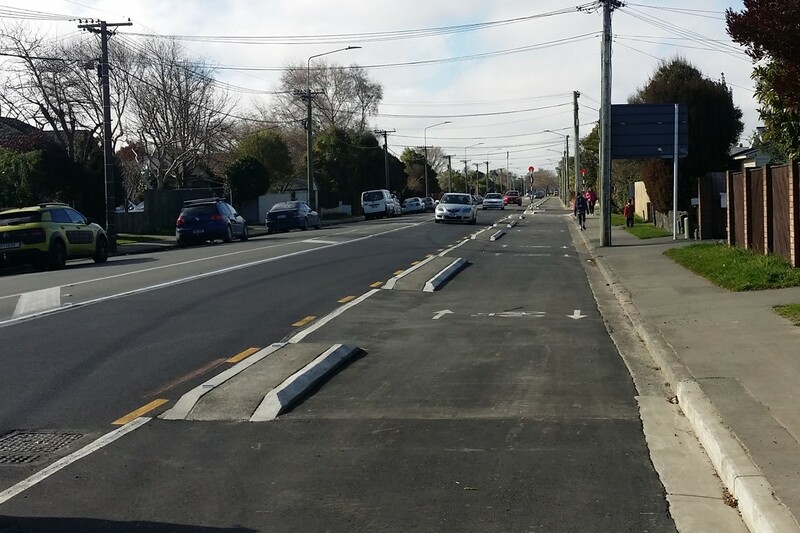 Adding separated cycleways reduces the space available for car parking, so typically parking spaces are alternated from one side to the other along this route. Parking is kept away from driveways (for sight distance), with the adjacent space often being allocated for placing wheelie bins on rubbish day. Most of this section allows for two bikes to fit in on each side, allowing faster riders to get past slower ones, but there are occasional narrower sections – have patience. 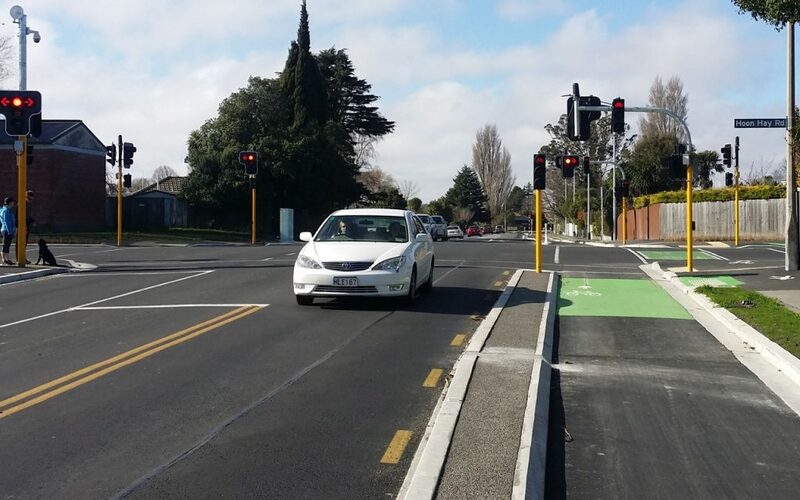 Keep an eye out for the white diamond markings approaching and at the signalised intersections – these show where the cycle detectors are if you want to get a green signal. At the moment, the cycleway stops at Moorhouse Ave and reverts to painted cycle lanes north along Antigua St. 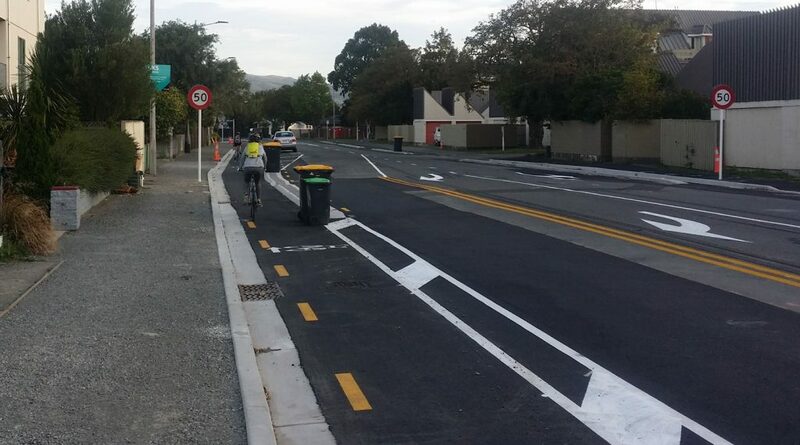 But in due course this section will also become a separated cycleway to connect with the new facilities in town. 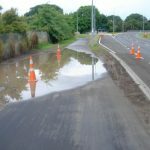 The Quarryman’s Trail now provides another safe cycling option for people heading to/from the southwest part of Christchurch. 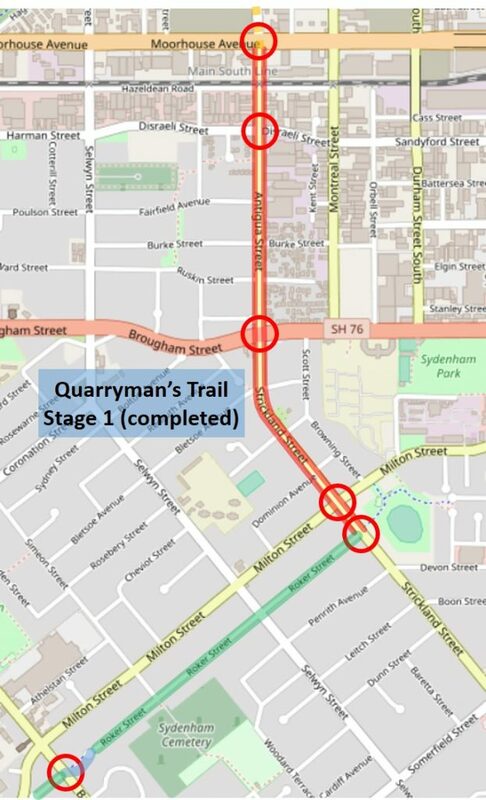 Don’t forget that consultation on some changes to the next section of the Quarryman’s Trail is currently out, closing next Wednesday. Have you ridden on the Quarryman’s Trail yet? The concret divider seems to be unnecessarily wide in the areas where there is no on street parking available. It is good that they have marked where they want wheely bins to be placed for collection. 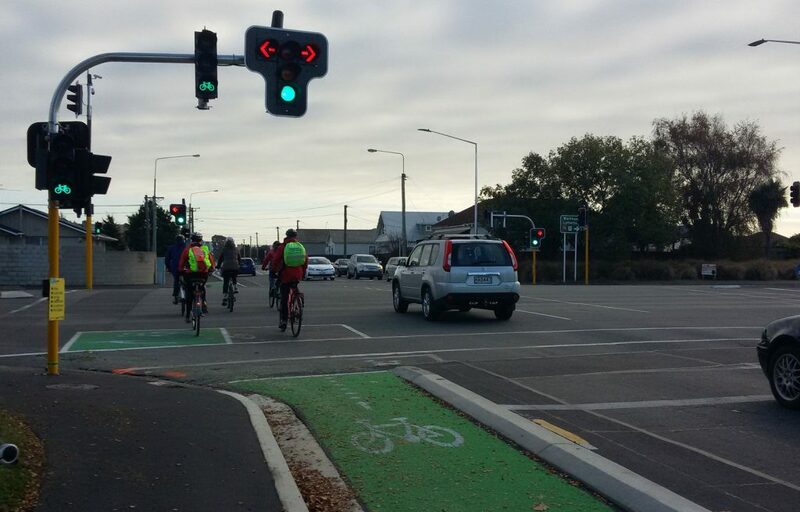 I like how the cyclists are separated off at some of the intersections (Selwyn and Strickland Sts) being able to wait to cross without a car right behind you will be less stressful for everyone. I am still not convinced on the use of hook turns and would probably revert to walking across rather than waiting that close to traffic going through the intersection. I have cycled it quite a few times and like it. 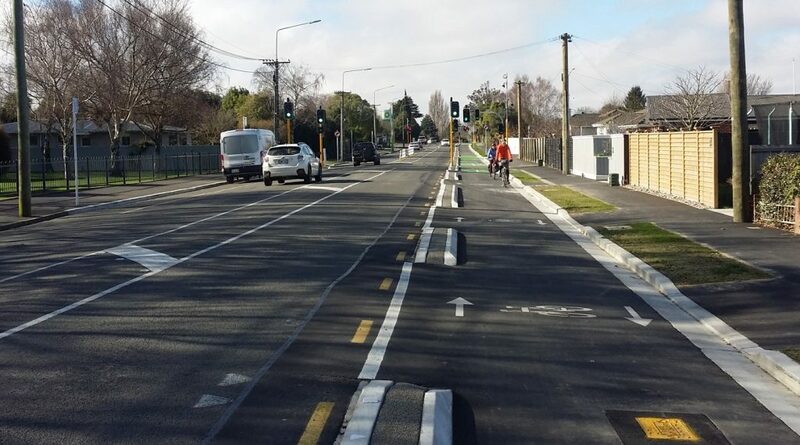 I notice that you say in this article that the “CYCLEWAY” will eventually go as far as Halswell. This is actually wrong. Those plans are scrapped and what is planned is a “SHARED PATH” there is a big difference between the two. 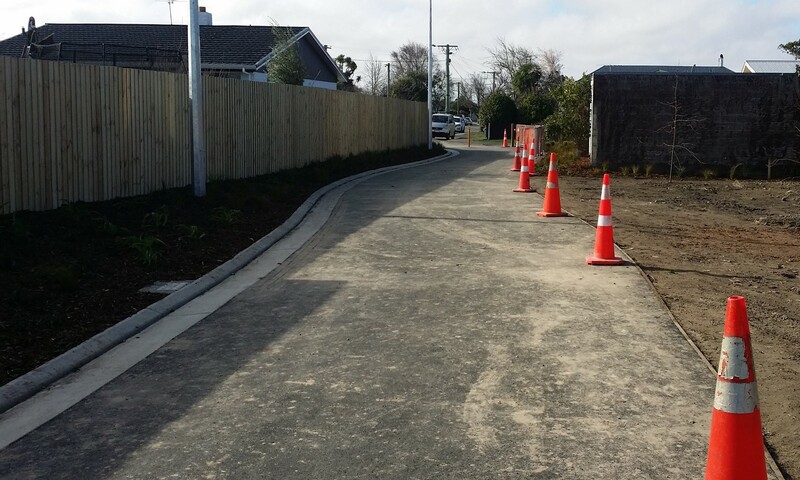 Shared paths mean cyclists are slowed to snails pace as they negotiate around pedestrians, dogs and runners that mostly have no concept of sharing a path or keeping left. 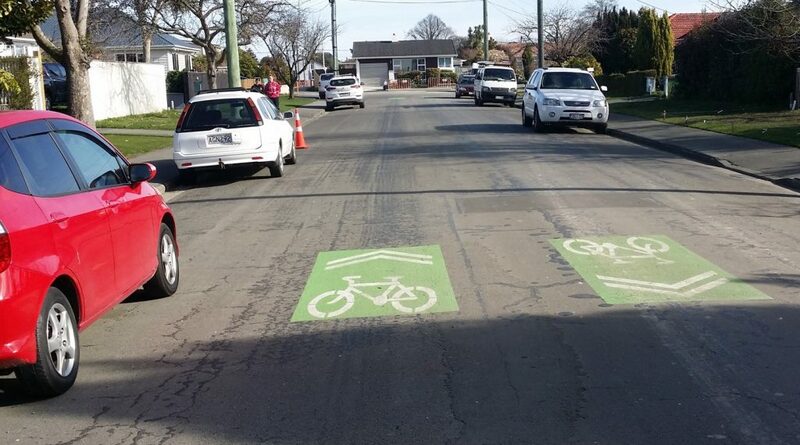 Yes mostly they are very good and something all Cantabrians can be proud of whether they cycle or not. But you do still have to keep your wits about you when cycling them. I cycled the Quarrymans Trail in the opposite direction than my usual today and the dual section along Sparks Road from Victors road to Roker Street felt strange. Concur – I have no trust in drivers pulling out and checking the “wrong” direction. Even pedestrians can’t remember to look both ways. Also, the long wait at the red bike-crossing light is aggravating. I’m inclined to return to the roadway and use the green light that road vehicles have, rather than stop and wait. 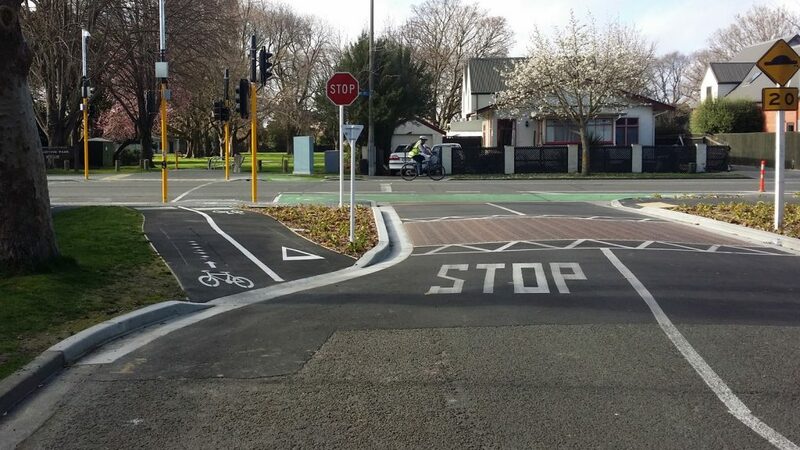 Efficient cycling is all about maintaining momentum, and a dead-stop is the opposite of that. Previous Previous post: Guest Post: Is cycling just for Rich People?